Celebrate love this February 14 with a smorgasbord of dining options at some of Brisbane's best restaurants. If dining out is your preference then take your pick from my curated list. For the most love-ly day of the year, Stokehouse will be hosting a special Valentine’s Day dinner, start the night with a glass of Bollinger ‘Special Cuvee’ before indulging in a delectable two-course meal plus shared dessert, for $120pp. If you can’t get to Stokehouse on the big night, you can also celebrate with their Valentine’s Day menu items available from February 9 to 18. Bookings essential. Indulge in a decadent three-course Valentine's Day menu including bread and salad to start, followed by an entree, main and dessert of your choice from 5-7.30pm and 8pm. Bookings essential. Treat your loved one to an enchanting cruise on the Brisbane River. Be spoiled with amazing views, a delicious seasonal buffet and live entertainment onboard the Kookaburra Queen paddle wheelers. Or, let romance sweep you off your feet with glittering views, live piano music, a delicious three-course menu and bottomless sparkling wine and beer aboard the new Voyager Cruiser. Bookings essential. Celebrate this Valentine's Day at Aria Brisbane, the Good Food Guide Award's 2018 winner of Australia's Best Wine List. A glass of champagne on arrival, canapés and a three-course meal complemented by incredible service will help you say 'I love you' in more ways than one priced at $185 per person, bookings essential. Enjoy the option of two sittings at Brisbane’s famed Cha Cha Char Restaurant this Valentine’s Day, from 5pm with a two-course menu available for $85 per person or from 7.30pm with a three-course menu for $120 per person. Bookings essential. Spoil the one you love this Valentine’s Day at Saké Restaurant & Bar Eagle Street Pier. Enjoy dishes from the a la carte menu or the special Valentine’s Day set menu which includes a glass of champagne for $125 per person. Bookings essential. 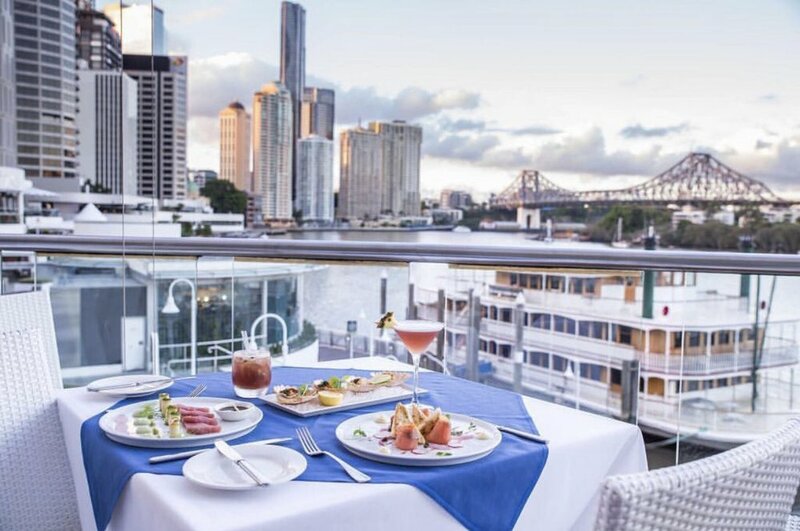 Indulge at Brisbane’s iconic Il Centro Restaurant & Bar this Valentine’s Day. Enjoy a two-course menu for $85 per person from 5pm or a three-course menu for $120 per person from 7.30pm. Bookings essential. Enjoy a three-course dinner with a glass of Veuve Clicquot served upon arrival for $115 per person. Enjoy a table in the river view dining area, a complimentary rose and your choice of either half a dozen oysters, a cheeseboard, or a dessert cocktail jug to share for an additional $85. Bookings essential. To book Valentine’s Day at Eagle Street Pier, see here for details. Plus park with ease this Valentine’s Day at Eagle Street Pier with Wilson Parking and take advantage of the $18 flat-rate parking fee when entering after 5pm on Wednesday 14th December. Book a Bay now at: eaglestreetpier.com.au. Treat your other half to an alfresco Valentine’s Day dinner this year with your pick of two a la carte mains followed by Chef’s dessert to share for $55 per couple at Victoria Park Bistro. If you fancy hitting a few balls, have a go at Victoria Park's Putt Putt course for $40 per couple after your meal. With twinkling fairy lights, canopy trees and romantic beats included Victoria Park is the perfect location in Brisbane for a fun, romantic and adventurous Valentine’s Day. Bookings essential: Call Victoria Park Bistro for reservations on 07 3252 0666. Take your pick from my list above and don't delay, book today to ensure your table is reserved this Valentine's Day.